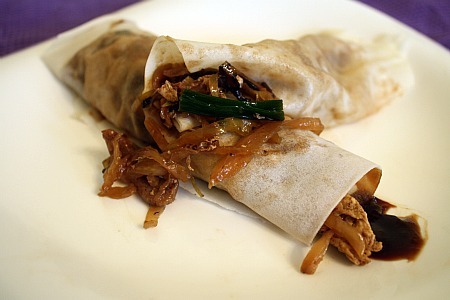 Are you familiar with what Moo Shu is? Simply put, it’s a stir fry that traditionally contains lots of vegetables and meat (very thinly sliced and/or shredded), and scrambled egg…served with hoisin sauce and rolled up into a flat thin pancake. What’s nice about it is that you can sub just about whatever you like if you’re not crazy about an of the typical ingredients. I really enjoyed this challenge. To some, it may seem like a bit much, given all of the components, but it is fairly simple and all comes together quite nicely. I made a few adjustments to the suggested recipe based on my likes and what I had available. All in all, we really liked it, and now if the mood ever strikes us to have Moo Shu, we know we’ll be able to satisfy our craving without picking up the phone. Here are the original recipes…again, they seem long and tedious, but it’s all easy to do! They are from the cookbook The Chinese Kitchen. Roll each piece into a ball, then, using the palm of your hand, press each piece into a flat pancake. Dust the worktop with more dry flour. Flatten each pancake into a 6 to 8 inch circle with a rolling pin, rolling gently on both sides. Once the dough has rested and been kneaded again, divide it into an even number of small pieces, rolling each into a ball. Working with two balls of dough at a time, dip the bottom of one ball lightly into sesame oil and press it onto the top of the second ball. Press the double layer flat, then roll the doubled pancake layers into 6 to 8 inch circles. In a dry pan, cook on each side until dry and lightly blistered (but without browning). Separate pancakes after cooking. Heat about 1 tablespoon oil in a preheated wok and scramble the eggs until set, but not too hard. Remove and keep to one side. To serve: place about 2 tablespoons of hot Moo Shu in the center of a warm pancake, rolling it into a parcel with the bottom end turned up to prevent the contents from falling out. Eat with your fingers. Simply mix all of the ingredients together by hand using a sturdy spoon. At first it does not appear like it will mix, but keep at it just a bit longer and your sauce will come together. The October Daring Cooks’ Challenge was hosted by Shelley of C Mom Cookand her sister Ruth of The Crafts of Mommyhood. They challenged us to bring a taste of the East into our home kitchens by making our own Moo Shu, including thin pancakes, stir fry and sauce. This entry was posted in Chinese, Daring Cooks, main dishes, make ahead, pork. Bookmark the permalink. Your Moo Shu looks great! I agree — the recipe looks long and complicated but it comes together pretty quickly. I had never had Moo Shu before, so I wasn’t too sure what to expect! I think I’d like to try getting it at a restaurant now, just to compare! Yours look great! I’m saving this, Melissa! Like you, I’ve only had moo shu out; when I’m in the mood to spend all day in the kitchen, though, I just might make it at home. I remember it tasted just delicious! 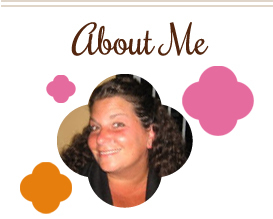 I am so glad that you found the recipe could be made to work for you. Your moo shu looks fabulous, and I am so glad that you had fun learnign with us!! Thanks for the recipe. I don’t eat a lot of Chinese, but I may just try this. Your moo shu looks absolutely mouth-watering, definitely an edibility photo – can’t stop looking at it 🙂 Beautifully done! I love finding out how to make take out dishes at home! They always taste way better!